Thanks to the expertise of senior lecturer SIMON WHIFFIN, an Eastbourne Prostate Cancer Support Group now has a new website to enhance its digital engagement. Simon was asked by colleague DEBBIE HATFIELD if he could help with upgrading the existing site. 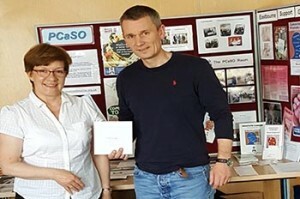 Debbie founded the group with her brother Graham in 2002 and now runs it with fellow organiser CHRIS CUTTING as part of the national charity Prostate Cancer Support Organisation (PCaSO). The Eastbourne support group wanted to update the site so that information was current, easily accessible and informative. They also wanted to attract an audience increasingly likely to engage with social media and so were keen to incorporate Twitter and Facebook. Tagged an Eastbourne Prostate Cancer Support Group, CHRIS CUTTING, CHRIS CUTTING as part of the national charity Prostate Cancer Support Organisation, DEBBIE HATFIELD, PCaSO, prostate cancer, SIMON WHIFFIN. Bookmark the permalink.